Avast! Overstrike Trailer. E3 2011. Posted on June 7, 2011 by Big Red	in Gaming Booty and tagged e3, ea overstrike, electronic arts, first person shooter, game trailers, games news, gaming, gaming news, insomniac games, los angeles, overstrike trailer, past the pixels, ps3, ratchet and clank, resistence, the incredibles, xbox 360 nintendo. E3 is currently underway over in Los Angeles where the latest games and software for consoles and PCs are showcased to a throbbing crowd of sweaty virgins gaming enthusiasts. Our good friend Grahame over at Past The Pixels gave us the heads up on this trailer for Electronic Arts latest game Overstrike, a first person shooter from developer Insomniac Games, (Ratchet & Clank, Resistance), which, as Grahame as already hinted, looks like a Quentin Tarantinoesque version of Pixar’s The Incredibles. Channel 4 News Goes All Brass Eye Over PSN Hack. Posted on April 28, 2011 by Big Red	in Political Booty, TV Booty and tagged brass eye, channel 4 news, current affairs, gaming news, news, ps3, psn breakdown, sony playstation, technology news. Following the monumental breakdown Sony has suffered in recent days with their Playstation Network, every news website, paper and channel have been featuring special reports on this story as legions of people, who are incapable of amusing themselves without the use of electronic gadgetry, are throwing party bags of Doritos around their living rooms in fits of rage. But Channel 4 News have to be applauded for their coverage of the story, simply due to a moment of genius which you can watch at the 3.00 minute mark in the video above. Avast! Bulletstorm Trailer Is Very Cheeky. 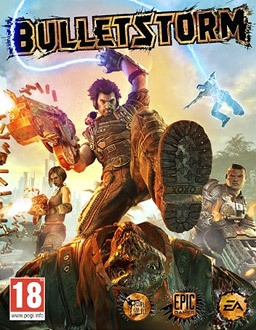 Posted on February 3, 2011 by Big Red	in Gaming Booty and tagged bulletstorm, bulletstorm funny video, bulletstorm trailer, call of duty parody video, duty calls trailer, games, gaming, gaming news, pc gaming, ps3, xbox 360 nintendo wii. The marketing people behind promoting Epic Game’s new first person action/fantasy shooter Bulletstorm are very clever and exceptionally witty. As you will see from the video above instead of advertising their own game and showing you how amazing it’s graphics and gameplay are in an exclusive demo of their wares, they’ve instead put together a parody video which rips the utter piss out of their biggest rival Call Of Duty. No doubt this will cause a major war between gamers where instead of grenades, insults will be thrown concerning sexuality and the general welfare of their mothers.